Quality, consistency, nutritional composition and the combinations in which foods are consumed can affect oral health, including tooth decay. Ongoing research is indicating that nutrients and antioxidants found in fruits, nuts, and vegetables may strengthen immunity and improve the body's ability to fight tooth decay caused by bacteria and inflammation. Foods that are good for your body are also being proven beneficial for your oral health. • Calcium fortified juices, milk, and dairy products. Vitamin D strengthens teeth and bones. 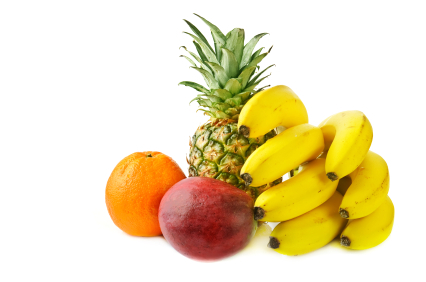 • Fruits and vegetables contain vitamin C which protects gum tissue from bacteria and infection. • Cheese contains calcium which mixes with plaque found in the mouth, sticking to teeth and protecting them from acid causing bacteria. • Folic acid in leafy green vegetables promotes healthy cell grown in the mouth and throughout the body. A diet that promotes good oral health is not just about what food to eat and what food to avoid, it is also about when to eat them. Foods that take a long time to chew or dissolve (dried fruits, meats, cough drops) can damage teeth because the sugar is held against the teeth longer than foods that dissolve quickly. Chewy foods are often high in sugar and should be consumed with meals when saliva production is increased and will naturally help wash away food and neutralize harmful acids before they attack teeth. Nighttime oral hygiene is extremely important. While you sleep, your mouth produces less saliva. Saliva is the body's natural defense against cavity-causing bacteria. With less saliva, bacteria in your mouth increases as does your risk for cavities and bad breath. To keep bacteria from growing as you sleep, you will want to make sure that you brush, floss, and use mouthwash before going to bed so there is nothing in your mouth for bacteria to feed on as you sleep. Flossing between teeth and underneath the gum line is especially important. Flossing helps remove food particles that are stuck or that toothbrushes are unable to reach and that bacteria need to feed on. Following up with mouthwash further helps to dislodge any remaining particles. If you happen to be up in the middle of the night, grab a glass of water and give a quick rinse to help rid your mouth of bacteria that might be forming and sleep well knowing that you have given your teeth the best nighttime oral care. Brushing and flossing teeth daily is the bare minimum for maintaining healthy teeth and gums. But is the bare minimum really enough for your pearly whites? 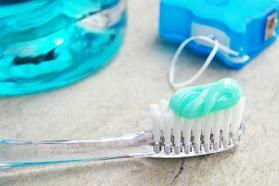 Consider adding the following tips to your dental hygiene routine and give your oral hygiene routine a boost. • Use Mouthwash- it helps remove stains, fights bad breath, and kills cavity-causing bacteria. • Go Crunchy- raw carrots, apples, celery, and popcorn are excellent natural teeth cleaners that clean as you crunch. • Time For a Change- change your toothbrush every two months and alternate styles when you do for different cleaning coverage, or consider having two different styles of toothbrushes on hand daily and alternate use. • Watch Your Tongue- a breeding ground for bacteria, brushing helps, but a tongue scraper allows your to reach further back and remove harmful bacteria. Copyright © 2010-2013 Henke & Okerstrom and WEO MEDIA. All rights reserved.